DCEU's latest entry is a hit! Most of the actors are perfectly cast, action is great, pacing is smooth, and the soundtrack is phenomenal! The villain is the weak point of the movie, but thinking objectively, that was one of the only options that the writers had (in order to have such violent action scenes - more on this below). David Ayer is a unique filmmaker and has a distinct taste. He also knows how to get the best performance from his actors (e.g., Christian Bale in Harsh Times!). He failed in getting a good performance out of Cara Delevinge though! Delevinge's Enchantress is written and acted poorly. There is a two-second sequence in which she does a weird voodoo dance; this sequence is probably the most awful thing that I have seen on screen in the last decade. Delevinge's acting aside, the character is shallow with ridiculous motivations. She summons her brother (which according to Wikipedia is called Incubus - but I don't remember that name being mentioned in the movie), and they want to disarm every country on earth. Task Force X is called to deal with this supernatural event, and also act as scapegoats for the government in case things go wrong. In the comics, Task Force X is usually sent to deal with more earthly threats, such as foreign dictators or street gangs. The magical threat of Enchantress and Incubus, is within the expertise of Justice League Dark whose members have included characters such Constantine, Etrigan, Zatana, Frankenstein, and Swamp Thing, who all have magical powers. I'd give a free pass to the movie for using a mystical villain just for one reason, and that is for rating. Let me elaborate: In the movie, Enchantress and Incubus used their magic to create undead zombies and sent them after the Suicide Squad. Since our squad was dealing with zombies, they were allowed to decapitate them, line head-shots after head-shots, and and still get a PG-13 rating for the movie. If the Squad was sent to topple a foreign dictator with such excessive force, the film would have become as violent as a Rambo or Expendables movie with an R-rating; thus, limiting the chance of recovering its huge production and marketing cost at the box office (of course Deadpool is the counter example to this argument - but that is a conversation for another time). The rest of the characters are cast perfectly. Margot Robbie stole the show as Harley Quinn with amazing lines and her flawless delivery. Robbie's performance is so good that many fans will hear her voice in their heads when they read the comics - I, however, still hear Arleen Sorkin's voice from the Batman: The Animated Series... 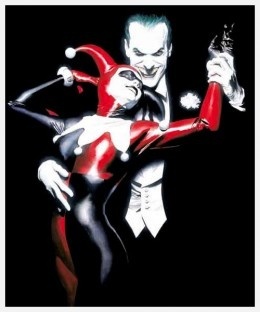 The film also provided the ultimate fan service by showing Harley in her Batman: TAS costume, recreating the beautiful cover drawn by Alex Ross. Jared Leto's Joker is great too. Leto does not redefine the character the same way that Heath Ledger did, but he still makes Joker his own. Ledger's Joker was a more calculated villain who had a cause - which was to act as an agent of chaos and prove a point about human values (or lack thereof). Jared Leto's Joker, however, is a self-serving, sadistic, psychopathic gangster who is impossible to predict. I cannot wait to see his chemistry with Ben Affleck's Batman in future entries in the DCEU. Rounding out the cast: Hats of to Viola Davis for her portrayal of Amanda "The Wall" Waller. She was strong and menacing in an effortless way. Davis' performance was on par with C.C.H. Pounder's from the Justice League show. The last shoutout goes to Jay Hernandez and Jai Courtney; their characters (El Diablo and Captain Boomerang respectively) were not well-developed, but they still managed to bring them to life and make them memorable. To wrap up, I do not think the choice of villain was the most appropriate one for this Squad, but it gave the filmmakers the perfect sandbox to play with their toys (or characters) in it. The movie made me interested in almost every character, and I cannot wait to see them again in the sequel or other movies in the DCEU. For entertainment value, and also being so faithful to the root of these characters, I'd give it a 10/10.